You must be a member of the Bogotá English Speakers Group to attend this activity. Would you like to join this group? Aca-scuse me??? Aca believe it! 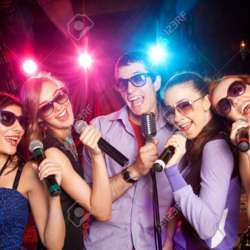 From Elvis to Nino Bravo to Shakira to Queen to Tupac...They offer a decent selection of karaoke songs in their library and an endless selection that we can access via YouTube!!!! There is a 15k pesos cover that goes toward a drink or food. Everyone pays for what they order/consume. 1. Cover begins at 8:00. I'll be there a little early and you are welcome to arrive before 8 to avoid cover. They have warned me that they are strict about the time, so if you arrive at 8:01 you will have to pay. 2. The picada they offer costs 85k pesos, is for 10 people, and must be ordered by Feb 1. Please arrange among yourselves and the venue if you would like to do this.